That's one of the league's old catchphrases from the 1980s, and it still rings true. In addition to being fantastic, things in the NBA can also get pretty dang strange, especially once the players leave the court, the crowds go home, and the lights in the arenas are switched off. Many eccentric guys have filled various starting lineups over the years, and have gone on to become downright legendary for their weirdness. They've drawn lots of attention for their bizarre spending habits, odd personal behavior, and, well, there's Dennis Rodman's whole persona, which probably belongs in a category all its own. He's still making headlines even though he retired from the NBA after the 1999-2000 season. Here's a rundown of several of the oddest players that have appeared in the league in recent years, along with a few others that helped set the bar when it comes to NBA eccentricity. Whether they're still playing or have since retired, these basketball stars are really weird people off the court. Russell Westbrook has spent his career playing for the Oklahoma City Thunder. He's also demonstrated some truly peculiar habits. That's one of the reasons the New York Times described him as a "misunderstood genius" in a 2017 profile written by journalist Sam Anderson. As Anderson revealed, Westbrook writes with his left hand, but shoots hoops with his right. Ambidexterity isn't all that odd, but Westbrook became angry when Anderson noticed this while he was signing a stack of documents. "Don't put that in your article," Westbrook told him. When Anderson jokingly tried to make a bargain with him so he could publish what seemed like a pretty insignificant detail, the point guard cursed at him. "[It was] with so much venom it made me laugh out loud," Anderson wrote. In addition to being sensitive about his writing hand and getting into weird feuds with the Golden State Warriors' Kevin Durant, Anderson is very particular about when the Thunder start their practice layups before each game. They must start when the pregame clock strikes exactly 6:17, but he has yet to explain why. 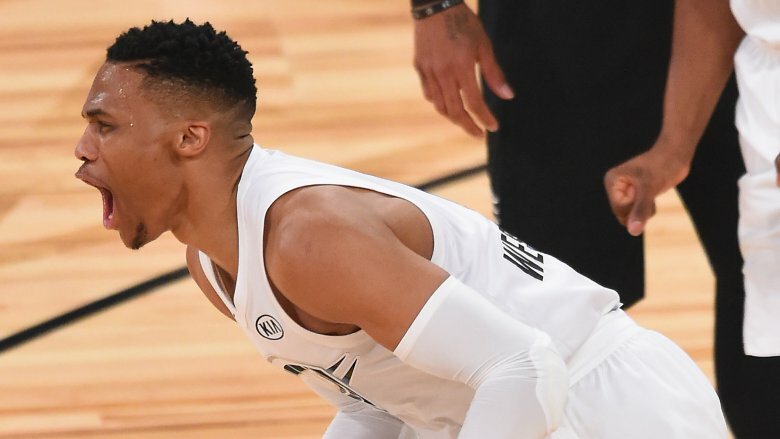 Westbrook, who made $26 million during the 2016-'17 season, also insists on paying all of his bills himself, and has been known to bring them into the Thunder lunchroom — and quibble over any amounts he thinks are incorrect. 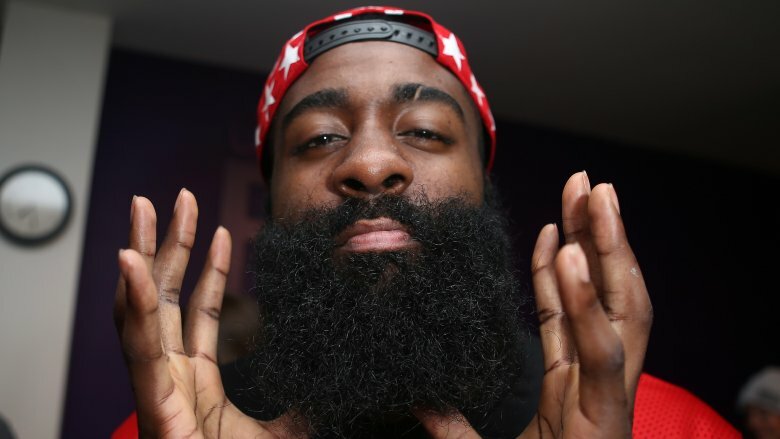 Along with owning a closet stuffed full of some pretty wild and stylish clothes, the Houston Rockets' James Harden has a face that's currently home to one of the most famous and downright craziest beards in NBA history. He's grown it long, and his career has grown along with it. The beard has helped him land lots of endorsement deals — one of which is pretty sweet, literally as well as figuratively. 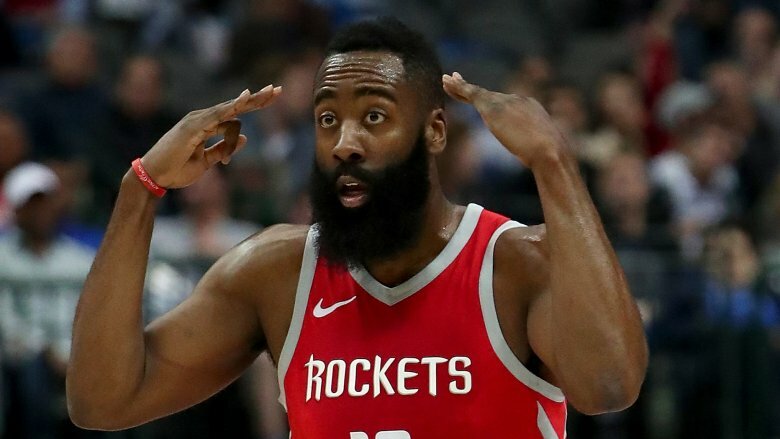 According to a 2016 article in Forbes, Harden signed a deal with Ferrara Candy's Trolli brand that kicked off with an odd advertisement revealing the contents of Harden's brain. Spoiler: the primary thing on his mind at the time was, apparently, the company's Sour Brite Crawlers. He also stores candy in his basketball and digs into it while driving towards the hoop, if this follow-up is to be believed. Later, his beard landed its own digital video and got to participate in a mock press conference, sans Harden. It even has its own line of gummi candy called Trolli Sour Brite Weird Beards, James Harden Edition. This all makes sense since Trolli's catchphrase is "Weirdly Awesome." Perhaps unsurprisingly, Harden's promotionals are dubbed "Beardly Awesome." His weirdness doesn't begin and end with candy commercials, though. He speaks a "secret language" with his close friends that includes words like "fa'lo." It means "excessively flashy," apparently. They've been speaking it with one another since high school. J.J. Redick likes to stay organized. Really, really organized. 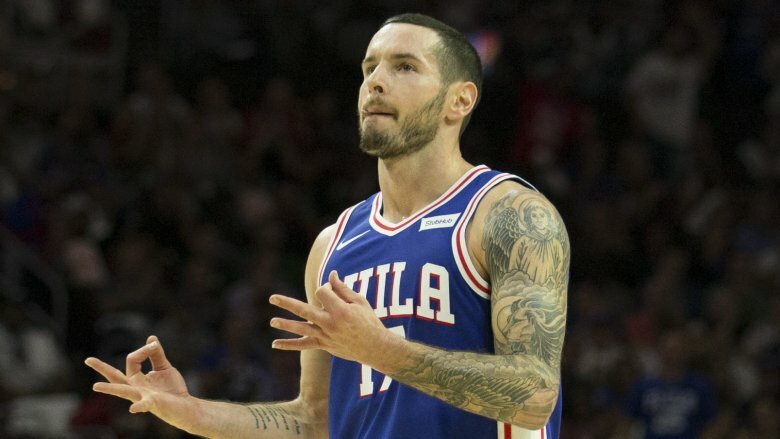 The Philadelphia 76ers' oddest shooting guard has turned this intense habit into something of an obsession. Redick metiously plans his naps, which socks he's going to wear, and his meals. His intense pre-game routine includes eating roasted chicken, a baked potato, asparagus or broccoli, and washing them down with a cup of coffee. While being profiled for the New York Times in 2018, he discussed one disastrous meal on March 22, 2013, when his dinner arrived 20 minutes late and "completely threw me off." The team lost that night by 24 points, and he missed ten of his 11 shots. As gametime approaches, his warm-up routine begins exactly 90 minutes before opening tip-off. It involves a series of stretches, practice shots, and eating exactly the right type of granola bar. At home, his closet must stay organized with "military-grade precision," and he seems to derive little joy from all that extra effort. As he told the Times, "You know what it is? It's exhausting." But not everything in his life is planned down to the second. While vacationing with his family in North Carolina, he somewhat spontaneously decided to join his grandmother on a journey to a tattoo parlor. She got a butterfly put on her shoulder. Redick, meanwhile, picked out a design that featured a reference to a Bible verse and the Japanese word for courage. There are short attention spans and there are shorts attention spans. 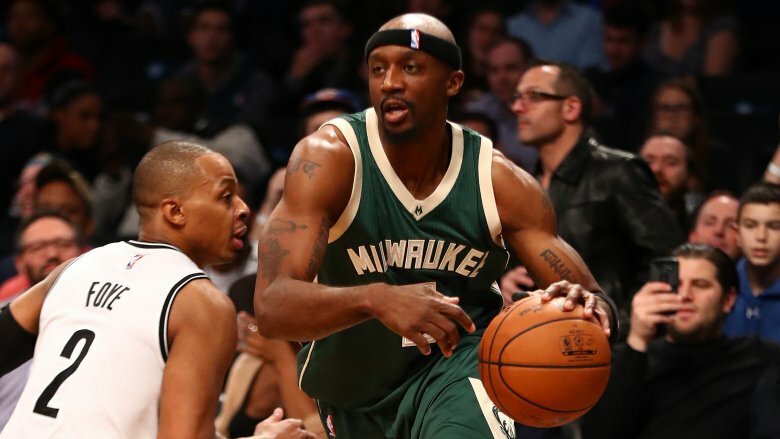 One of Jason Terry's routines might be best described as the latter. The night before each game, the shooting and point guard, who often goes by the nickname "JET," wears the shorts of the opposing team. The tradition began during his college days, when he and teammate Mike Bibby wore their uniforms to bed in order to calm down and get some shut-eye before an important game. As Terry explained, he got bored with wearing his own gear, and this keeps him entertained. His wife, however, isn't a huge fan of this routine. The Times also noted that he used to obsessively eat fried chicken fingers before every game — another routine, this one supposedly inspired by Wade Boggs. As he's gotten older, though, Terry has switched over to a healthier rotisserie or grilled chicken. "I can't deviate from chicken," Terry said. "It has to be chicken." During games, his rituals include imitating an airplane if he lands a series of three-pointers and changing his sneakers if things aren't going well during the first quarter. Nevertheless, Terry knows his behavior is at least a bit strange. As he told the Times, "my daughters say I'm a weirdo." Stephon Marbury had a career in the NBA that ran from 1996 until 2009. He made the All-Star team twice and co-wrote a children's book. Sadly, it all began to unravel after his final season. In July of 2009, Marbury went online and began what would become a 24-hour long tirade that he livestreamed for his StarburyTV web show. During the stream, he took questions from viewers; when asked if he believed in aliens, Marbury said that he didn't know and added, "But I believe in Jesus because I saw him in the shower the other day." He also said that he was looking forward to meeting the spirit of Michael Jackson and ate Vaseline on camera. That last bit was particularly strange, but Marbury explained that it was his grandmother's old remedy for curing a sore throat, according to a rundown on the incident that later appeared in The Los Angeles Times. Marbury clearly wasn't in a good place at the time of the unusual broadcast, but he went on to a successful post-NBA career in China. He helped the Beijing Ducks, a Chinese Basketball Association team, win three championships between 2012-2015. He also popped up in a Chinese musical about himself, titled I Am Marbury. As of September of 2017, he was reportedly mulling over returning to the United States for an NBA comeback or a spot in rapper/actor Ice Cube's Big 3 league. 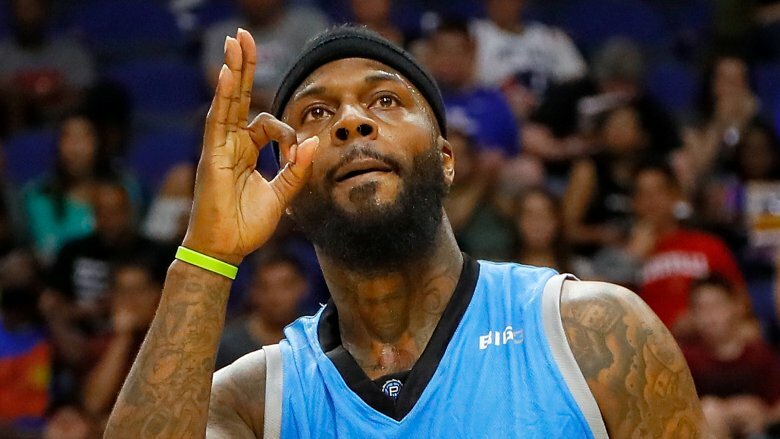 DeShawn Stevenson had a 13-year career in the NBA; along the way, he earned a reputation in the league for some pretty peculiar behavior. One of his quirks included doing a strange gesture every time he made a three-pointer, waving his right hand in front of his chin while he headed back across the court to play defense. He even gave the gesture the nickname "I Can't Feel My Face." One collection of potential interpretations from the Washington Post suggests that it all had something to do with a neurological disorder, a reference to the 2000 Johnny Depp film Blow, a tribute to the dance moves of rapper Tony Yayo, or possibly all three. Whatever the reason, the "I Can't Feel My Face" gesture spawned t-shirts. There's also the tattoo on his neck of Abraham Lincoln — and the ATM Stevenson keeps in his kitchen. According to TMZ, he was inspired to install one next to his fridge after he found out former professional skateboarder Rob Dyrdek had one added to his own house during the production of an MTV reality show. Stevenson apparently paid $3,500 to have it put in, and charges a pretty steep $4.50 transaction fee. Oh, and a few times a year he restocks it with $20,000 in cold, hard cash. Gilbert Arenas played for multiple NBA franchises before he went to China to join the Shanghai Sharks in 2013. Prior to leaving the States, he shared his tips for avoiding traffic tickets on his Instagram account — his favorite was leaving the dealer plates on his vehicle. As The Bleacher Report explained, it once helped Arenas run 60 red lights in four months and not get caught. Needless to say, he shouldn't offer driving lessons anytime soon. Along with blasting through red lights, he also once got caught speeding in a truck filled with fireworks — and without his driver's license. 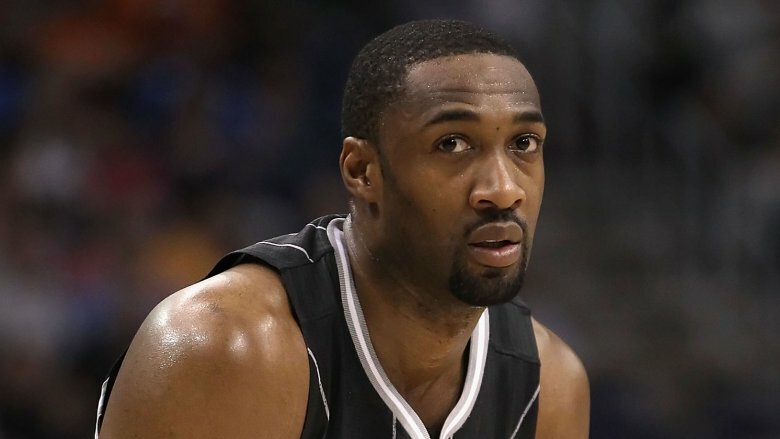 Along with getting a Barack Obama-themed tattoo on his left hand, Arenas' other eccentric behavior during his NBA days included a 2009 incident with his former Washington Wizards teammate Javaris Crittenton. After the two got into a disagreement over a card game, Arenas showed up in the team's locker room at the Verizon Center with four guns and threatened Crittenton, who then turned around pointed his own gun at Arenas. Fortunately, no one was injured in a standoff that, as their teammate Caron Butler later quipped, could have led to a much different "shoot-around" than usual at the arena. The two were booted off the team, and Crittenton was later sentenced to 23 years in prison for a shooting gone wrong. This peculiarly named former NBA star was anything but peaceful during much of his NBA career. 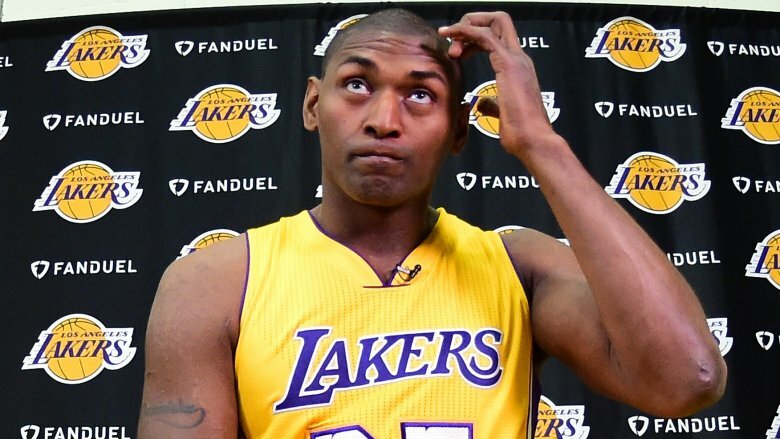 After a 2003 loss to the Knicks, the player formerly known as Ron Artest destroyed a $100,000 TV camera and a monitor in Madison Square Garden. The camera's lens alone reportedly cost $60,000, according to the Washington Post. Years prior, the small forward also decided to get a job at Circuit City during his rookie year in the league. He wasn't hard up for cash after a season that netted him a $1 million salary. He was merely bored and worried that he'd been partying too much. World Peace only worked a single shift, though. Maybe it's for the best. Customers can get awfully cranky at times and World Peace didn't always get along with NBA spectators and his fellow players. His clashes included a fight — infamously dubbed "The Malice in the Palace" — that spilled out into the stands during a game in Detroit and led to him being suspended for much of the 2004-2005 season. To take the edge off, he also used to drink French cognac during halftimes while he played for the Chicago Bulls. He's much more laid back these days, after legally changing his name to his current peaceful moniker in 2011, and currently works as a player development coach for the South Bay Lakers. No list of weird NBA players would be complete without the man who could one day prevent (or cause) a nuclear war with North Korea. Before he started hanging around with Kim Jong-Un during his "basketball diplomacy" treks to the closed-off kingdom, Rodman was widely considered one of the most eccentric guys to ever play professional basketball. The former power forward announced he was getting married to an unnamed person during the 1996 offseason. This sparked countless rumors, among them that he was getting hitched to Princess Diana, Julia Roberts, Cindy Crawford, or Oprah Winfrey. When his wedding day finally arrived, Rodman instead rode around New York City dressed in a bridal gown and announced that he had decided to marry himself before attending a book signing for his first autobiography, Bad as I Wanna Be. 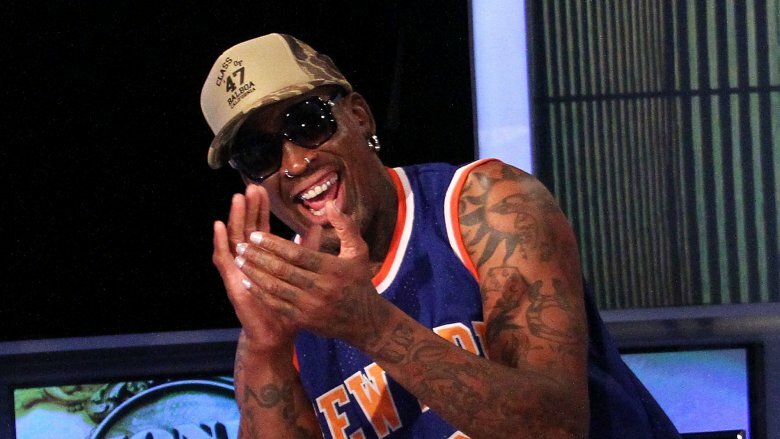 As The Fiscal Times recounted in 2014, Rodman's other antics included dating the equally eccentric Madonna, dying his hair tons of different colors, kicking a cameraman in the crotch, co-starring in a Jean-Claude Van Damme action flick along with a follow-up, and wrestling alongside Hulk Hogan in the WWE. He's spent at least one portion of his retirement years working as the commissioner for something called the Lingerie Football League. Rodman made his first trip to North Korea in 2013, after which he called Kim Jong-un "a friend for life." Once upon a time, Darryl Dawkins made smashing backboards during his super awesome dunks a fairly regular habit. 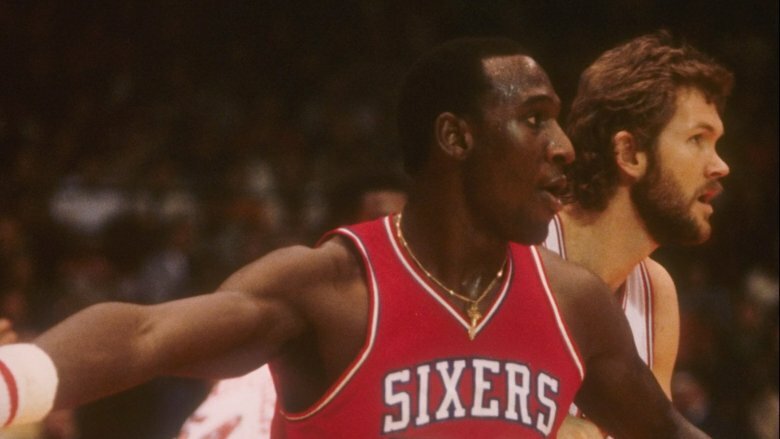 It was one of the things that helped him earn the nickname "Chocolate Thunder." Strangely enough, it was coined by Stevie Wonder — who, for obvious reasons, never actually saw him play. Okay, Dawkins only smashed a few backboards. However, it did lead to the league replacing their fairly fragile hoops with ones that had breakaway rims and shatter-resistant backboards. Dawkins' exuberant personality and weird behavior made him hugely popular in the 1970s. He gave his dunks names like "The Look Out Below" and "The Yo-Mama." Shaquille O'Neal once described him "as the father of power of dunking," adding "I'm just one of his sons." Dawkins also still holds the top spot in the record books for most personal fouls in a season. While that isn't too weird, he also routinely claimed he was actually a space alien from "The Planet Lovetron." The strange persona and interstellar lifestyle he created along with it included frequent "frolicking" with his girlfriend, nicknamed "Juicy Luicy," and spreading the gospel of what he called "interplanetary funkmanship." Dawkins, who passed away in 2015, is sadly no longer with us. But before he left the realm of earthly mortals, one of his weird post-basketball forays included guest judging a boxing match between Mr. T and Rowdy Roddy Piper at Wrestlemania 2 along with jazz legend Cab Calloway.